Sushi balls. Fun sushi at home. When we started writing this blog, one of the promises we made ourselves was to use the blog as motivation to cook new things at home. And so far we are making progress, but mostly with new tools like sous-vide and using “molecular gastronomy” ingredients in baking. But the next step was for us to explore new cuisines, and we went right for Japan. We love Japanese food and have a favorite local sushi bar and are even members in a Sake tasting club (great fun), but rarely cook anything other than tempura at home. But we decided that needed to change. So we bought Debra Samuels’ “My Japanese Table”, a cookbook with Japanese recipes adapted for the American kitchen. Samuels is a well-regarded food writer for the Boston Globe and lived /cooked in Japan for ten years, so we took the plunge. So far the cookbook is a good read, with plenty of simple recipes for Japanese basics like teriyaki and tempura. But we know what we wanted to do at home, sushi. And this recipe is why we bought the cookbook. Sushi balls are very pretty sushi that you can make at home. And its fun…really. 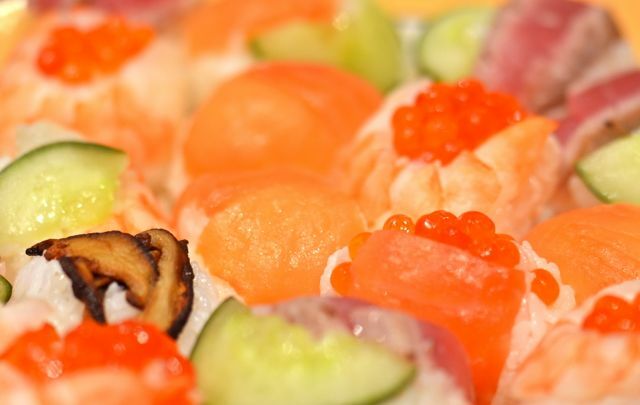 Smoked salmon, salmon roe, seared ahi, shrimp, cucumber and shiitake mushroom. Usually the big issue with making sushi at home is actually constructing the rolls. 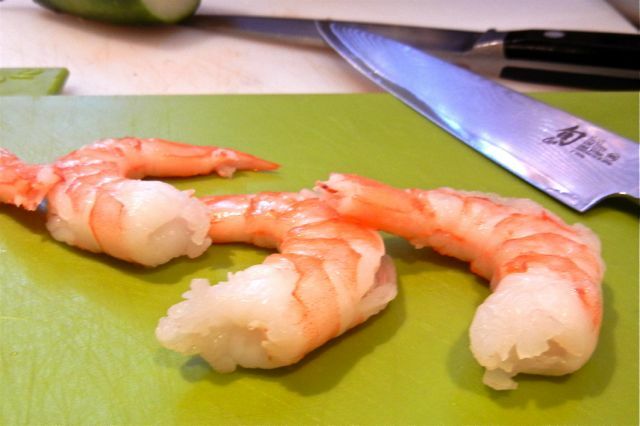 Sushi rice is super-sticky and the shaping tools are uncommon for most home cooks. Without constant practice, home sushi can look like a train wreck. And while the flavor of the sushi can be good, the presentation is a big part of the dish. One way to handle this challenge is to simply prepare the rice and ingredients and then present them with nori as a buffet for hand-rolls. But with Sushi balls, anyone can make an attractive individual piece of sushi. You can even have fun and experiment with presentation. The trick is to simply place the fish or veggie on a square of plastic wrap, then place a tablespoon or so of rice on top (be sure to keep your hands moist with water when handling the rice). Then bring up all the corners of the plastic wrap and twist tightly into a ball. When it unwinds, you have a well-shaped sushi ball. It only takes a few tries to get the hang of it, and then you can experiment with different combinations of ingredients. Samuels suggests cooked shrimp, lightly salted cucumbers and smoked salmon. We added some seared ahi, salmon roe and browned shiitake mushrooms. Cooked crab or scallops would also be very good additions. But feel free to experiment based on taste and budget (and this is an inexpensive dish). Cooked rice, sprinkled with Sushi-zu seasoning. Now that shaping the sushi is less of a challenge, the real effort goes in making the sushi rice. While in sushi bars “mastering” the rice can take years, it is something you can do well at home- on the first try. The trick is to buy the correct rice and follow all of the steps. For the rice you need short grain japonica rice, which is available in most supermarkets. Don’t substitute long grain rice. As for the steps, you must rinse the rice and then either soak it for cooking or use a rice cooker- the recipe deals with both. 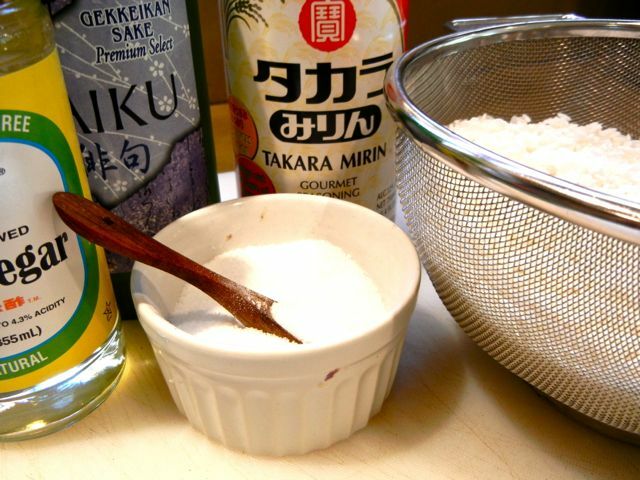 While the rice is cooking you make the Sushi-zu seasoning of rice vinegar, sugar, salt and mirin. When the rice finishes cooking, you place it in a bowl and then gently sprinkle and mix the Sushi-zu seasoning with the rice. Then fan the rice to cool it down. The rice should stick together but not be mashed or “gluey”. But if you use the right rice and follow each step you will get consistent, tasty, results. 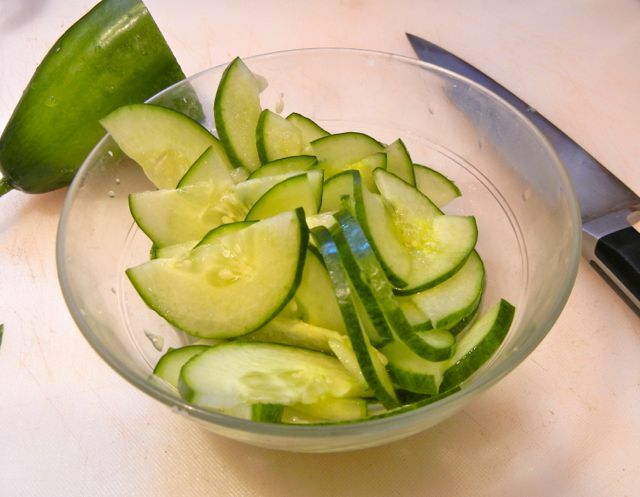 Slice cucumbers, sprinkle with salt, wait for 5 minutes and drain. Done. Slice lengthwise and drizzle with lemon juice. Assembly area. Note measuring cup with water for dipping hands. 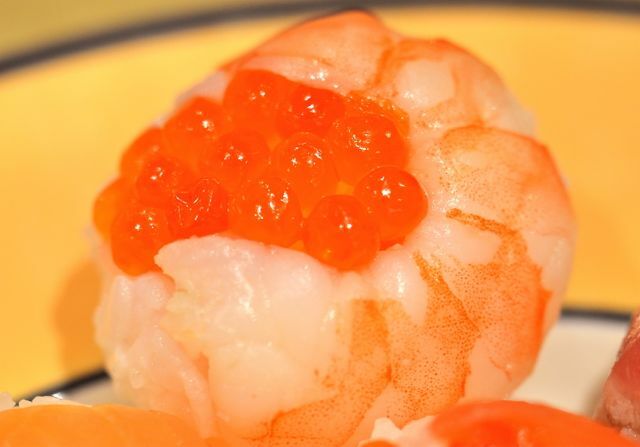 Shrimp and salmon roe sushi ball. At home we made the rice then placed all the ingredients in an assembly line. We cut a few squares of plastic wrap and were off to the races. Our friend Roger visited and he was pressed into service helped us shape the sushi balls. It took about 10 minutes, with some “guidance” from the kids. But that was part of the fun, they got to “design” a few sushi balls for themselves. And while the sushi balls may not look as “pro” as nigiri from you local sushi bar, they were very pretty and quite tasty. The recipe provides steps for cooking the rice in a pot or rice cooker. We use both, but the rice cooker is easier and just as good. The key to handling sushi rice is keeping you hands moist with water while handling the rice. The stuff will stick to almost any dry surface. The recipe is easily adapted for groups of different size, but expect about 1 cup of rice for 8-10 sushi balls. What You Get: Tasty, attractive sushi at home. What You Need: A large wooden bowl for mixing the rice and seasoning, a large salad bowl works well. Plastic wrap. How Long? 60-90 minutes, depending on how you cook the rice. About 20 minutes of assembling the ingredients and sushi. This is a bit of a “special occasion” dish, but can be made on weekdays with some planning. Great fun on weekends. 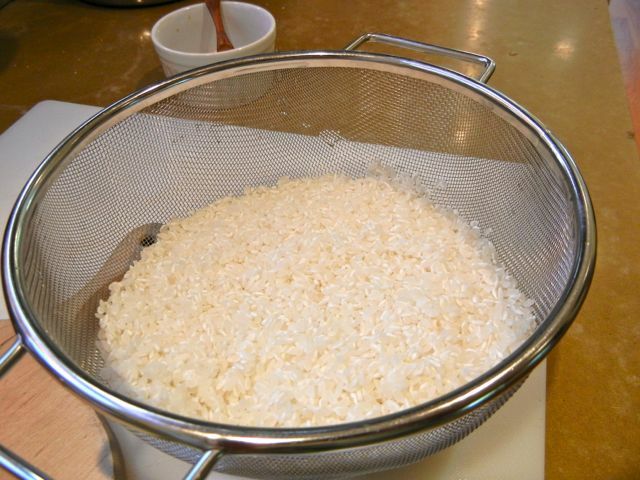 Pour the rice into a colander and rinse under running water until the water is clear. This may take a minute or two. If using a rice cooker, let the rice drain for 30 minutes. Then add the rice, water, sake and kelp (if using) to the rice cooker. Cook, following the rice cooker’s instructions. If using a pot, soak the rice in water for 20 minutes, then let the rice drain for 30 minutes. Then add the rice, water, sake and kelp (if using) to a medium saucepan. Cover with a lid and cook the rice over medium heat for 10 minutes. Then turn the heat to low and simmer for 10 minutes or until the rice is tender. You total cooking time will be about 20 minutes. Turn off the heat and let the rice sit for 10 more minutes. While the rice is cooking, combine the vinegar, sugar, salt and mirin in a small saucepan over medium heat. Cook until the salt and sugar dissolve and then remove from the heat and allow to cool. 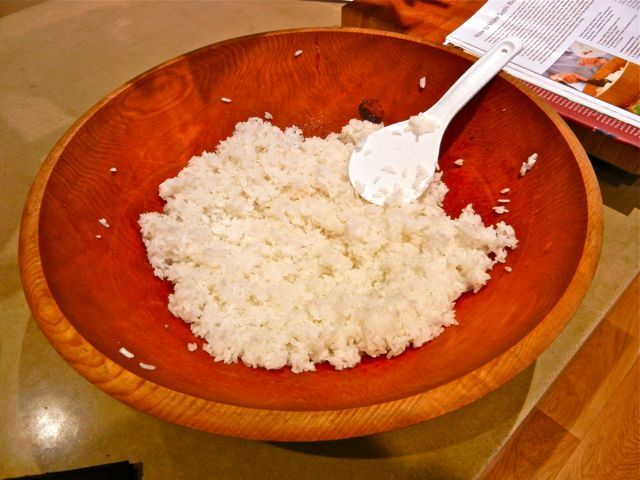 When the rice is done, transfer it to a large (preferably wooden) bowl. Gently fold and lift the rice, do not mash it. Slowly sprinkle the seasoning on the rice and fold to combine, this will take a few minutes. Taste as you mix-in the seasoning, you may not need it all. When rice is seasoned, fan the rice to cool it and then cover with plastic wrap until ready to make the sushi. 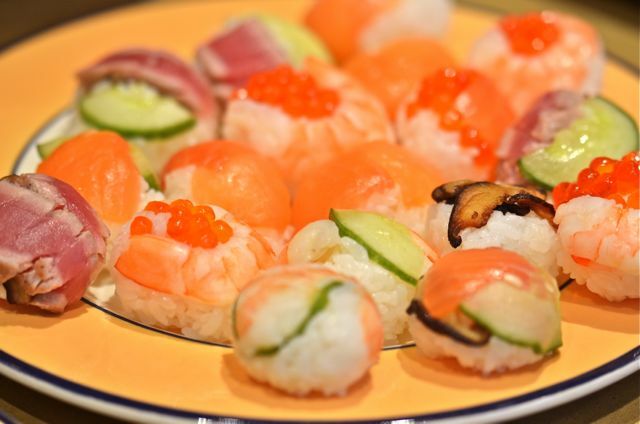 Cut plastic wrap into roughly 6×6 inch squares, make as many squares as needed for those assembling the sushi. Place the sushi rice and ingredients near each other in an assembly area. 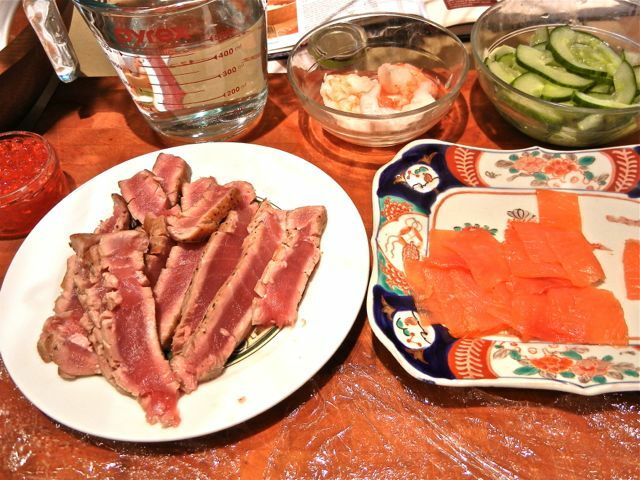 Make sure to have a bowl of water to keep hands moist while making the sushi. Place the a small piece of fish and/or vegetable in the center of the plastic wrap. (Add a dot of wasabi or Sriracha, if you like.) Then place about 1/8 a cup of sushi rice on top. Bring the corners of the plastic wrap up around the rice and then twist tightly into a ball. Unwrap gently and then place the sushi ball on a plate. repeat. Serve with soy, wasabi and pickled ginger, if you like. yum! I never would’ve thought to do sushi balls. I always try rolls and its so messy! Wow! So colorful, looks fresh. So pretty! You make it sound very do-able, too. Thanks for taking the intimidation out of the process! Great post! They look phenomenal! These are gorgeous! I love making sushi balls for parties (even though I do veggie ones). Have you tried making tamago? I think you might like it. And we love tamago (kids too) but have not made it ourselves. We do have a recipe and will try it. Hello Putney Farms from Debra Samuels! 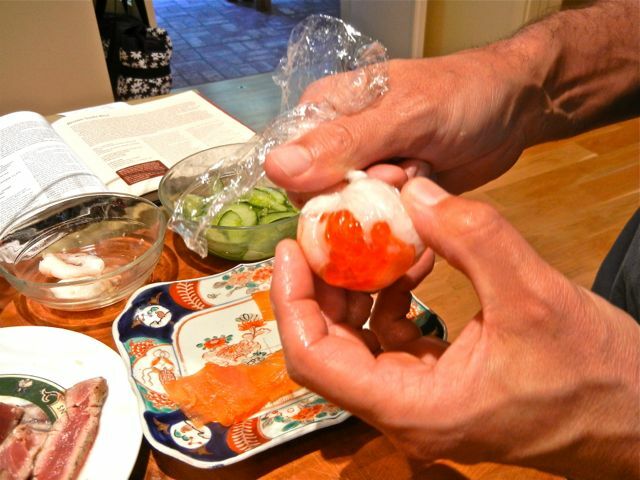 I so enjoyed reading your blog about making the temaki zushi balls in my cookbook. There is nothing that gives an author and teacher more joy than hearing positive feedback about a recipe. I am glad you and your family enjoyed making them. Your photos are great and your creativity inspiring! Gambatte! Go for it! Thank you so much for the kind words and the great recipes. We enjoyed making the sushi balls and the recipes were great. We look forward to working our way through the cookbook. Great idea in doing sushi balls. I’m going to try it sometime. I love eating sushi but I can’t make the perfect rolls. Great fun and very tasty- really worth trying! Thanks for reading. nice work!! Thanks :).I will try tomorrow!! Thanks for reading our blog, we hope you enjoy the recipe. It is very fun and easy- worth trying. Thanks for reading! wow, it looks very beautiful, and i THINK IT tastes good too.